There's something romantic, I think, about an Autumn themed wedding. The leaves on the trees are changing colour, the nights are getting longer, days slightly colder but not quite cold enough to warrant getting out the BIG coat. There's also something about the light at this time of year that seems a little more romantic than the full bloom of summer. Maybe it's because I got married in October, but it's always been a special month in a perfect season to me. The weather, if it's possible in the UK, can be even more random in the Autumn. I've helped plan weddings that have basked in 20-degree sun whilst others have struggled with downpours at under 10 degrees. The thing with this season is to be prepared for anything, parasols and brollies, and possibly wellies just in case. If you're thinking about, or planning an Autumn themed wedding, the colour palette available is huge, bright and bold. If you're not a fan of bright oranges and reds it doesn't have to be a focal colour but you could use it as an accent or tone it down with peaches and deep pinks or burgundy. This is the time to add elements like acorns, pine cones, or even pumpkins to table displays, venue dressing and bouquets. Of course, you can follow your colour scheme through to other elements like bridesmaid outfits or grooms accessories (tie, handkerchief, cumberband). 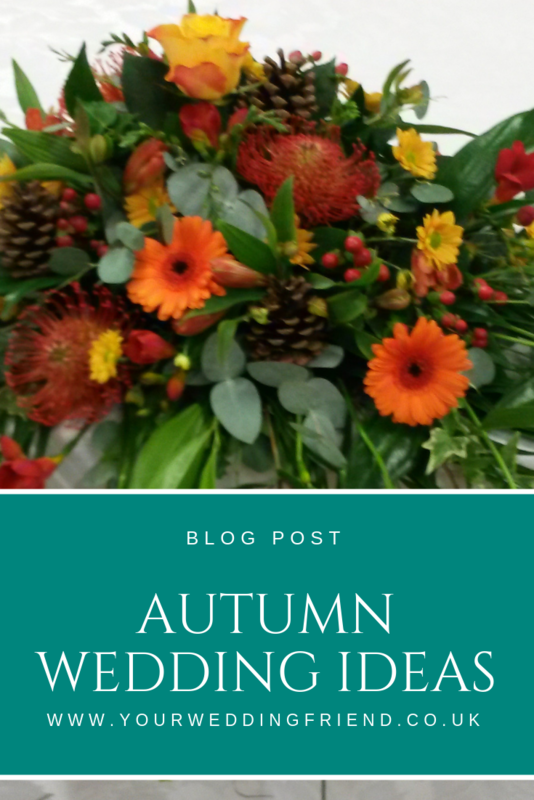 Venue choice can be key to a successful Autumn themed wedding, if you want to embrace the look and feel of the season. If having access to outdoor areas that will wow guests is important to you, make sure you look at them in the same season as your wedding will be. If you're set on a venue with no trees or grounds, then try bringing the outside in by using dried leaves in your displays or stamp out your own Autumn confetti. Unless you're doing everything in one location you'll need a reliable wedding vehicle. You might just get a good day for having the roof off, but chances are you'll need one, and a little bit of luxury travel works wonders for the nerves. Wedding photographers will want to get group pictures taken early in the afternoon as the nights start to draw in but dusk around 6-7pm ish at this time of year will give you some amazing shots of the two of you, so allow a bit of extra photography time around then. Take advantage of the usual lull between the wedding breakfast and evening reception. And don't forget the clocks go back at the end of October so amend timings as needed. Wedding venues and caterers start to change their menus at this time of year to embrace warmer options, so if you want to keep those reminders of sizzling summers going let them know sooner rather than later. This is when the spice cabinet gets raided and people start mulling things. Cocoa and smores (or toasting marshmallows), and sparkler send offs, are a preview for Bonfire night and the winter wedding season.